The Kumbh Mela is one of the largest peaceful gathering on this earth. It happens every three years in rotation across four cities of India- Haridwar, Nasik, Ujjain and Prayagraj (formerly known as Allahabad). This year the gathering is on confluence of the Rivers Ganga and Yamuna at Prayagraj. It is being held from January 14 to March 04, 2019. According to the Hindu legends the mela (fair) is ageless. In the ancient times the Gods and the Demons churned the sea (Samudra Manthan) to get Amrit (immortal nectar). It was to be eventually shared between the two. The churning process also produced ratnas (gems) which were shared as promised. But when Amrit was found, Gods managed to take it all away. In the ensuing flight and fight, four drops of nectar fell at the four places mentioned above and that is where the Kumbh Mela is held. It is said that the planetary positions are similar to the sea churning when the Kumbh is held. 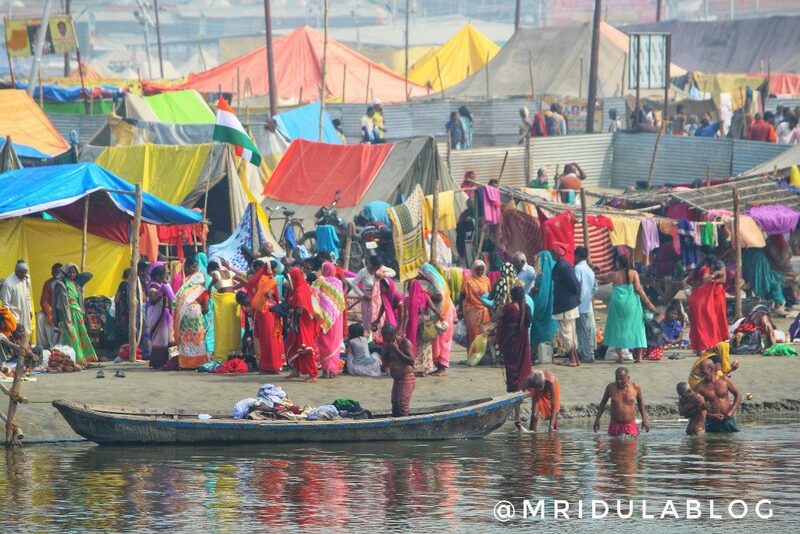 Kumbh is a gathering of saints and sadhus, who stay by confluence in temporary tents. They deliberate on the matters of public interest including politics. Common people come to seek the blessings of the saints. It is believed that by taking a dip in the Holy confluence you can wash away the sins! 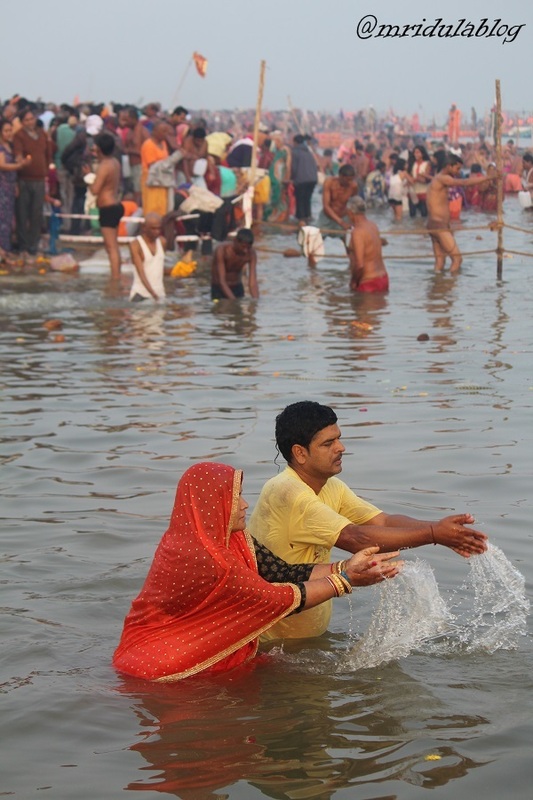 There are certain auspicious dates known as ‘Shahi Snan’ (special bathing days) when about 30 to 40 million people take the dip within a single day. Within this gathering, there are naga sadhus. They smear ash over their bodies and shed clothes! And they are totally comfortable with their nakedness. They adorn the body with garlands etc, and they can be openly seen smoking pot. An aura of mystic and mystery surrounds them. 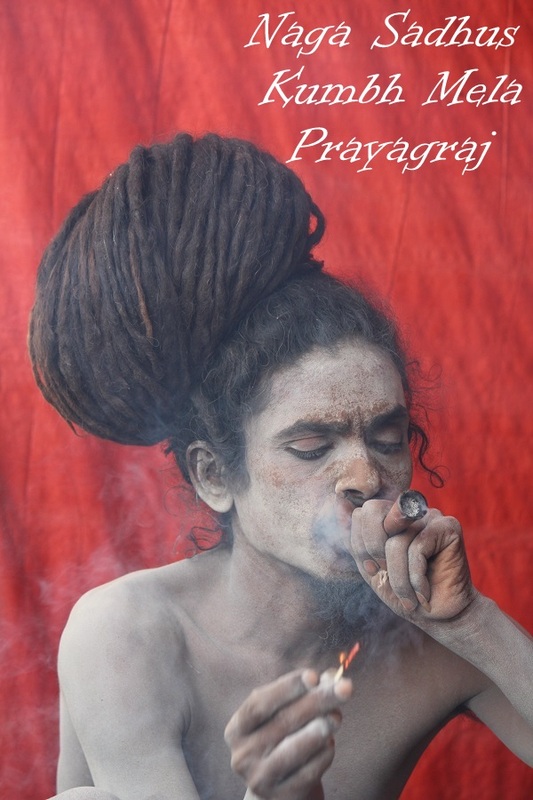 If you do a quick search on the internet the common opinion that naga sadhus live in caves in the Himalayas. They can be seen only at Kumbh. No one sees them coming or leaving the Kumbh Mela! I had an opportunity to see the naga sadhus at Kumbh. We were in a mixed group of Indian and foreign media. Accompanying us were two guides Satish and Rakshit (from Experience Varanasi). 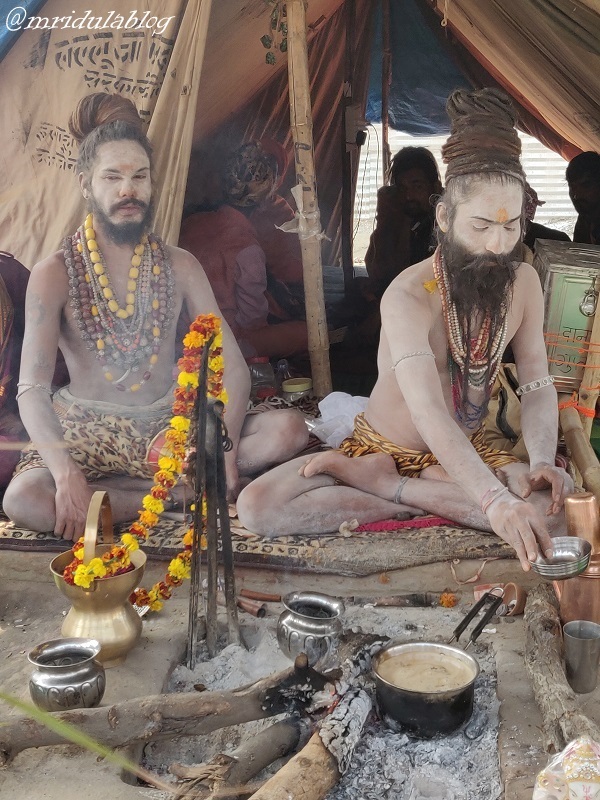 The sadhus organize their stay in groups known as Akharas. The two biggest Naga Akharas this year at Kumbh are Mahaparinirvani Akhara and Panchdashnam Juna Akhara. 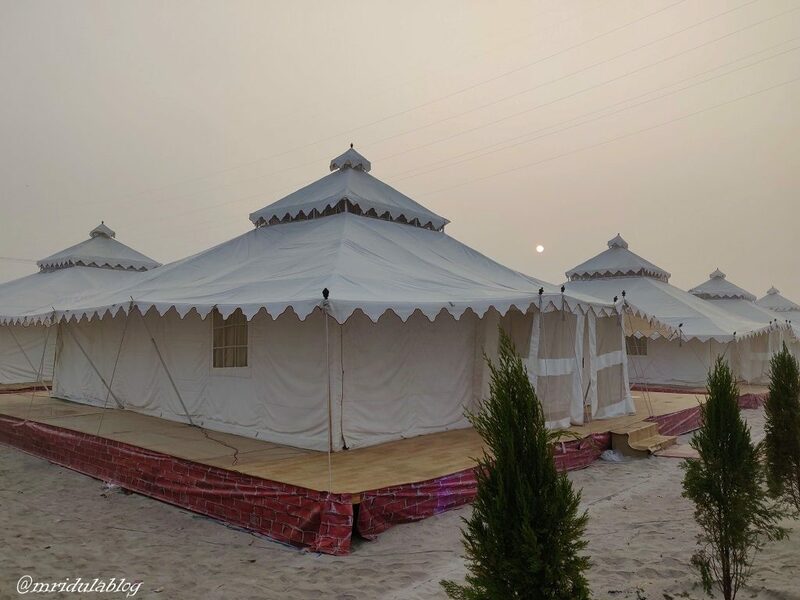 An Akhara is a large area where many tents belonging to the same group are pitched. We managed to walk past by the Juna Akhara. 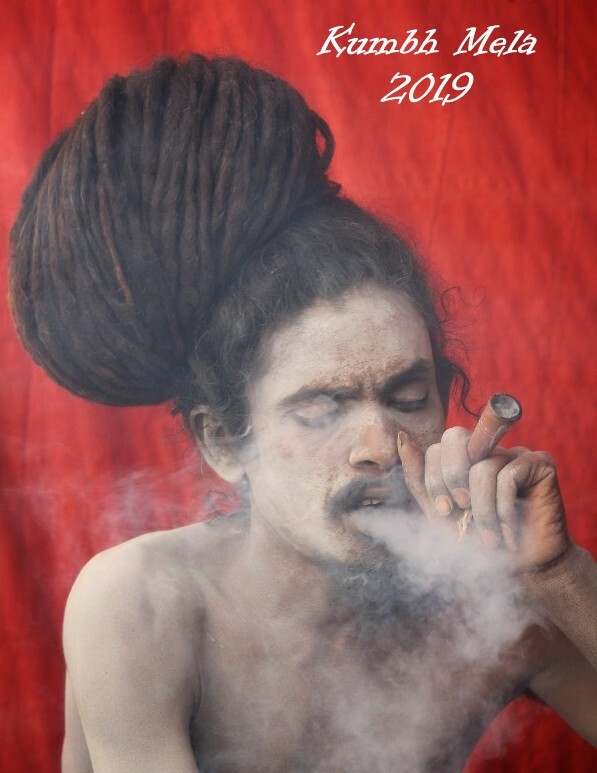 Anyone who goes to Kumbh wants to interact with naga sadhus and click pictures. Being social media professionals, we were big on clicking pictures, but we were not sure what was the correct way to go about it! The naga sadhus were not too happy if you did not put some money before taking the picture. This led to some confusion among us. Were they not ascetics who have renounced everything? Why was money involved. A few in our group tried to picture a group without their permission and they were chased away by a trident wielding sadhu! We had an impromptu gathering around our wise guides. They said we should stick together and the guides would negotiate the access for us. What followed was something like this- one of the guides would stand with folded hands and ask the sadhus for permission. Seeing that we had foreigners in our group, the sadhus asked if we would give dollars! Our guides were leaving Singapore Dollars in the offering! Then we could click photos. Now this confused the hell out of me! I decided to run my dilemma through Kunal. His take was that though the sadhus have no family they still have a belly to feed. The money offered will go towards the basic things. I also feel as we were in a big group, we were attracting attention. If we were walking in ones and twos no one would mind. However, if you wish to go close or want a selfie, I think a token amount of money is expected. I have lived in India all my life I do not necessarily buy outlandish explanations. To me all the naga sadhus living in the high caves of Himalayas fell in that category! Once again, I decided to check with Kunal as I was interested in his take on it. He said two of the biggest Naga Akharas at this Kumbh are Mahaparinirvani Akhara and Panchdashnam Juna Akhara. They are from Varanasi! So, not all of them live in Himalayas! But when the sadhus live near the society, they wear clothes. Hence, we don’t ‘see’ them! 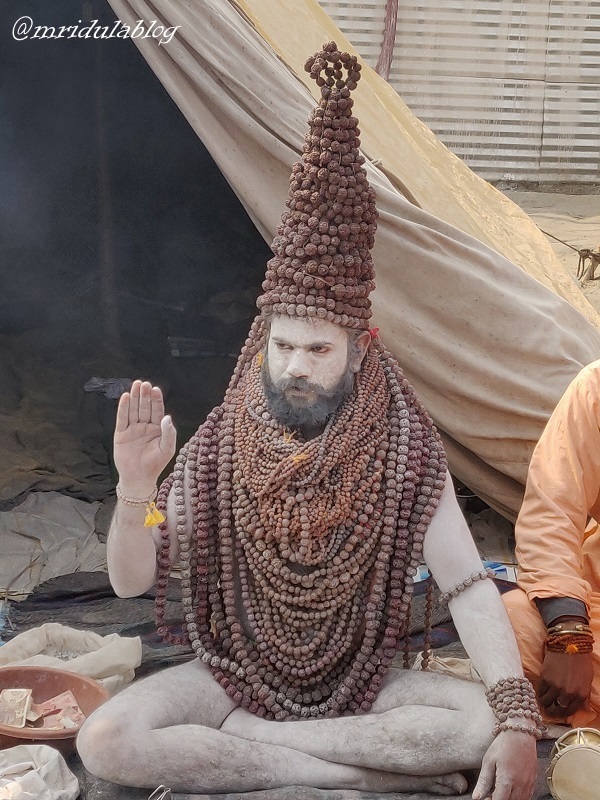 They take their Naga Avatar at Kumbh hence we see them! We don’t see them coming and going because once again they wear clothes when they travel! When internet throws a sensation, there is nothing like checking it with a local! What I have experienced and explained about naga sadhus and Kumbh is but just at the surface. I am sure there are many layers to this phenomenon, that I was not even able to touch in my short visit. But I am glad I went! It is quite an experience to see so many people from all walks of life come together united in their faith! When I got an invitation from the UP Government and Lonely Planet Magazine India to visit the Kumbh Mela at Prayagraj I accepted it without any hesitation. I was under the impression that I would never be able to do it on my own, so I was thrilled that I could be part of the media group to visit Kumbh. 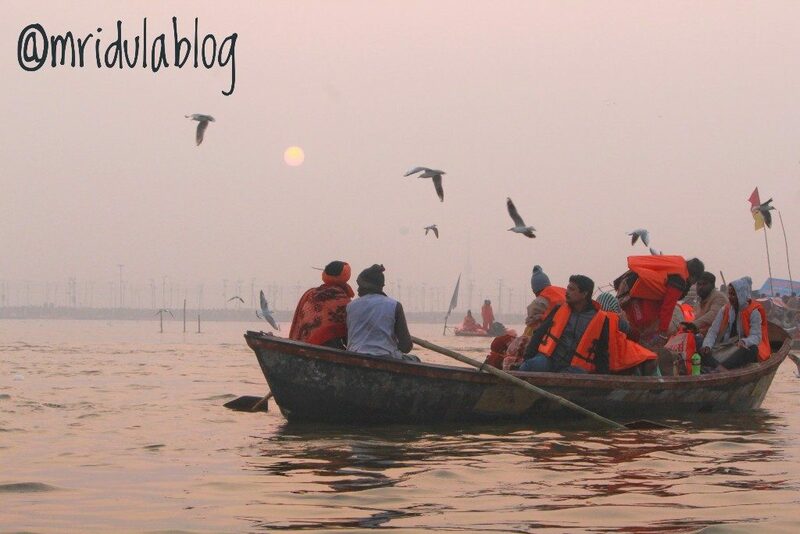 I am now back from the visit and though I will write many posts, it is easier to start with the nuts and bolts of what to expect at the Kumbh Mela in Prayagraj. Consult the Official Website: If you wish to visit Kumbh Mela please consult the official Kumbh Website, it will provide answers to many of your questions. The mela is held at four locations- Nasik, Ujjain, Prayagraj and Haridwar. 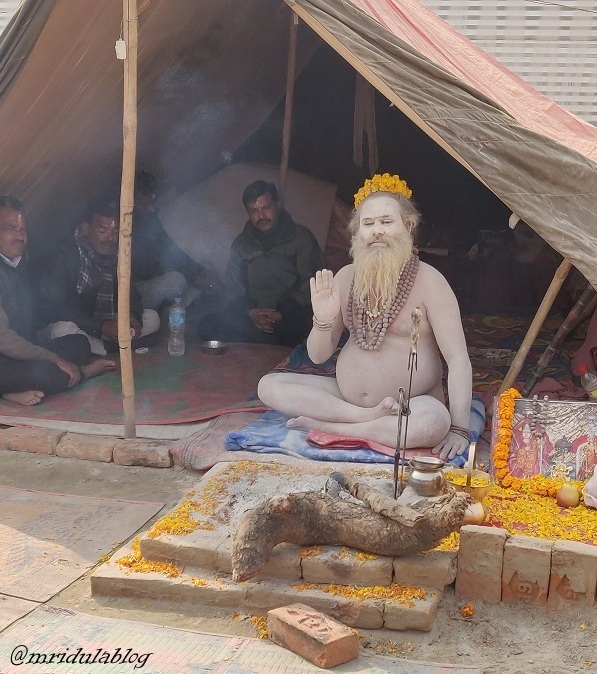 This post pertains to the Kumbh Mela 2019 at the Prayagraj. Also no one invites anyone to Kumbh Mela, people reach the site on their own. It is primarily a gathering of sages and saints but common public and travelers, including foreign guests, turn out in huge numbers. The mela is basically about saints, sadhus and mystics who gather at Kumbh to deliberate on topics of public interest including politics. The impression among the public is that it is too crowded and difficult to attend gathering. 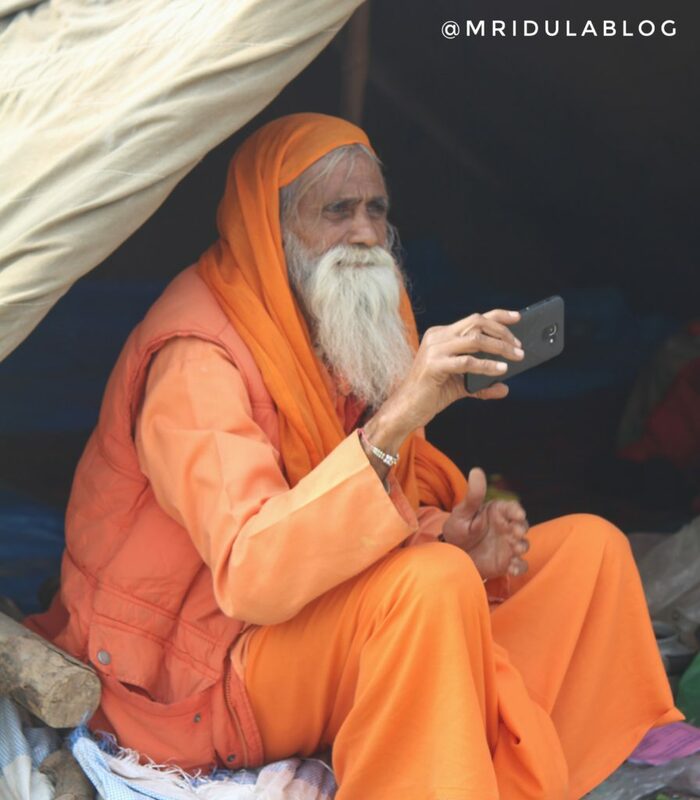 When I posted pictures from the Kumbh on my Facebook I got private messages within the first few hours with requests to share practical information about the Kumbh Mela. When to Visit? The Prayagraj Kumbh Mela is held from January 15 to March 4, 2019. However there are 6 special dates January 15, January 21, February 4, February 10, February 19, and March 4 known as Shahi Snan (special bath). This is when the Akharas (religious sects) take bath in a procession and millions gather at the Sangam. If you wish to have a peaceful experience, don’t go within a few days of the Shahi Snans. 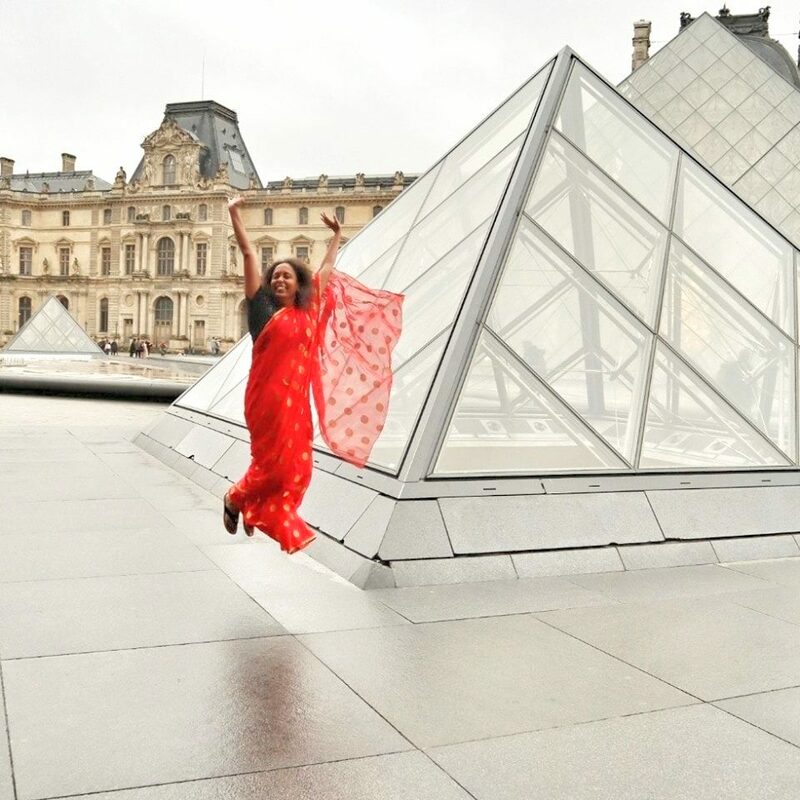 Allow the crowd to get in and get out of the city on these big days and then visit the mela. You will still get the experience minus the crowd. Visiting During the Shahi Snans: I was at Kumbh for the February 4, Mauni Amawasya Shahi Snan. 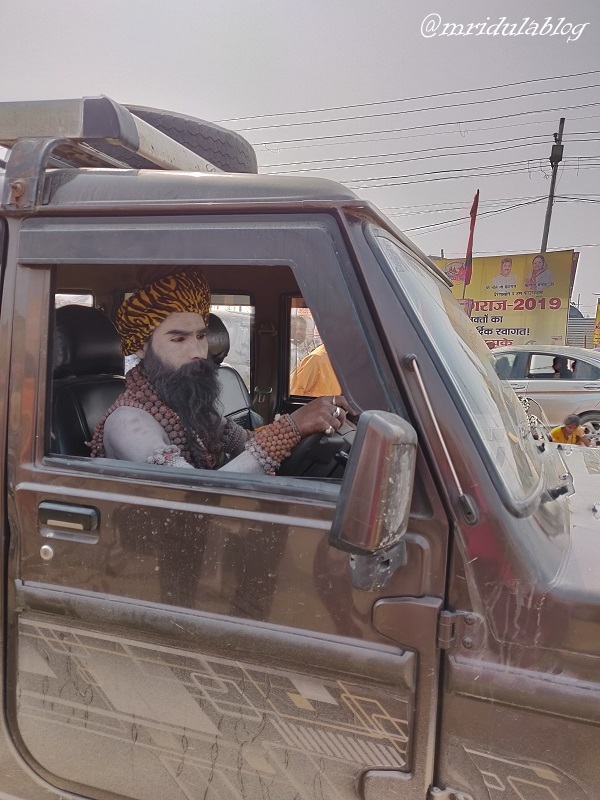 We entered Prayagraj on February 2, and we faced a traffic jam to get to the Indraprastham Tent City. But it was still livable. However, if we tried to enter on the day of the Shahi Snan it would have been a logistical nightmare as there would be huge traffic restrictions in place to manage the flow of the people. If you wish to enter on the day of the Shahi Snan be prepared to walk a lot on foot. We however tried to exit Prayagraj on the day of the Shahi Snan i.e. 4th February. It was a nightmare. We knew there would be a huge traffic jam if we tried to cross over via the city. So the organizers took a detour, which in the end turned out to be of 160 km. It took us close to 14 hours to reach Lucknow from Prayagraj in a backbreaking bus journey. Hence my recommendation- if you are planning to go during the Shahi Snan get in two days before and leave after two days, so that the crowds have dispersed. Visiting During the Other Days: If you visit during the other days, you will still find a lot to do, minus the insane crowd. You can drive in to the tent cities with relative ease. 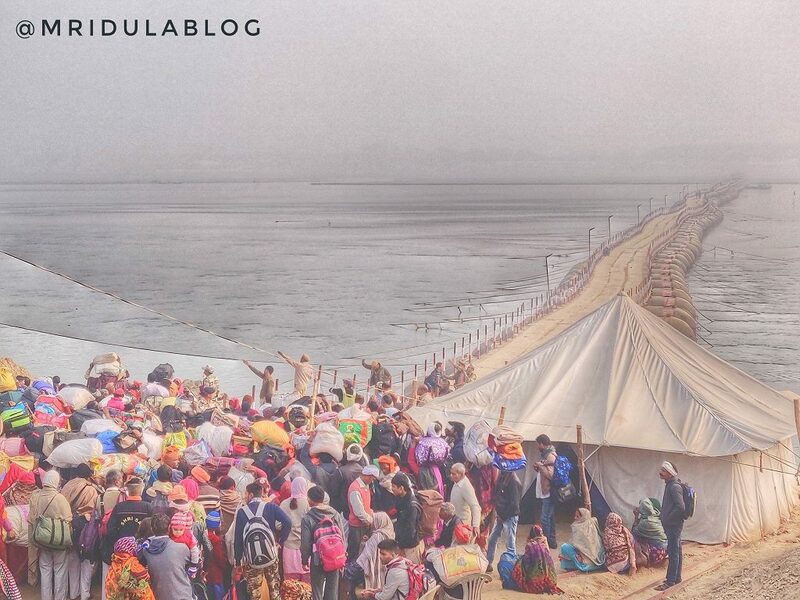 If you plan to stay in the city and visit Kumbh it is still feasible. 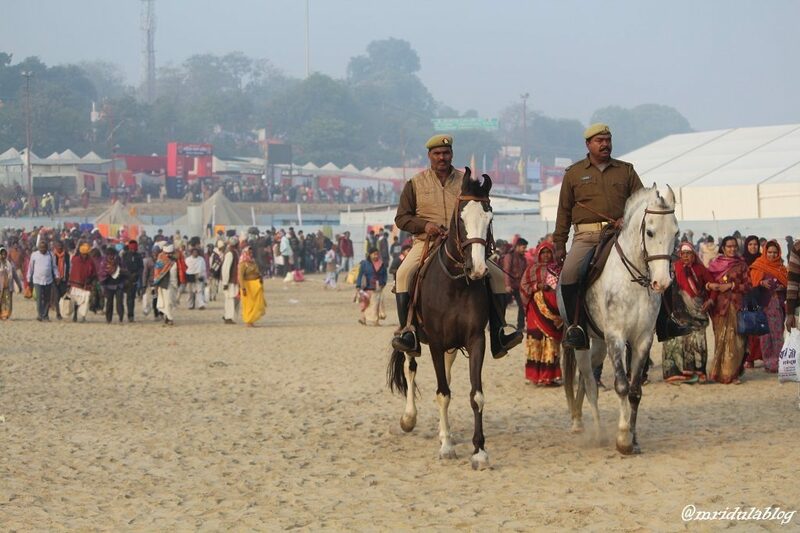 Do take a look at the Traffic Plan offered by the Mela Authorities. Where To Stay? We stayed at the Indraprastham Tent City which I believe is the more costly option. It is also far from the Mela but they have e-rickshaws to ply guests from the tents to the nearest pontoon bridge (19 in this case). 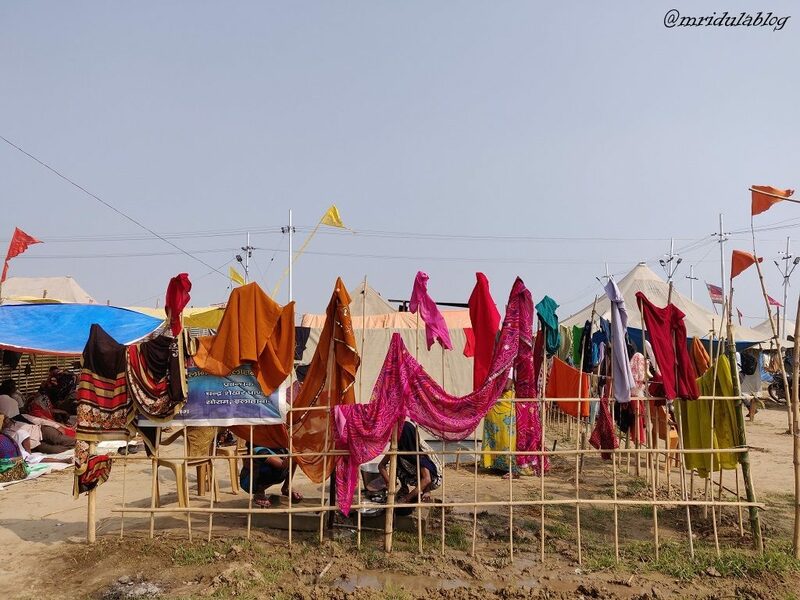 Here is a list of tents available within the Kumbh Mela Grounds. On ordinary days staying in the city is also a good idea. You can visit the mela grounds during the day and get away to a relatively quite place afterwards. For truly adventurous souls there are public accommodations that can be booked at the site for 100 to 200 rupees. Here is the information about the most basic accommodation available at the mela. 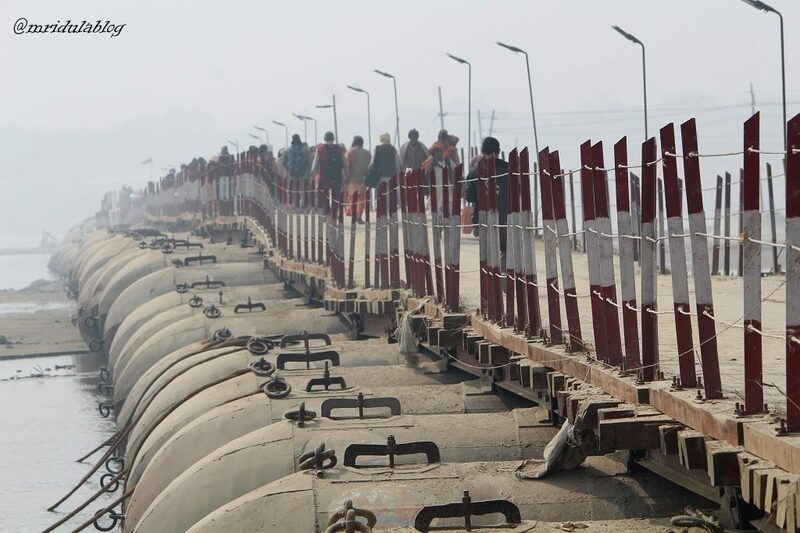 Crossing Over to the Mela Grounds: There are pontoon bridges to get into the Kumbh Mela. It may happen that when you wish to cross over, the bridge nearest to you might be closed. There are thousand of security personnel deployed. CCTV cameras are used to control both the crowds and the traffic. If the administration feels that the grounds are getting too crowded they may close a few bridges to manage the crowd. Please bear with them and cooperate with them. The Experience: I walked along the Kumbh Mela site extensively with my media group and two guides Kunal and Satish. And I was impressed with what I saw. 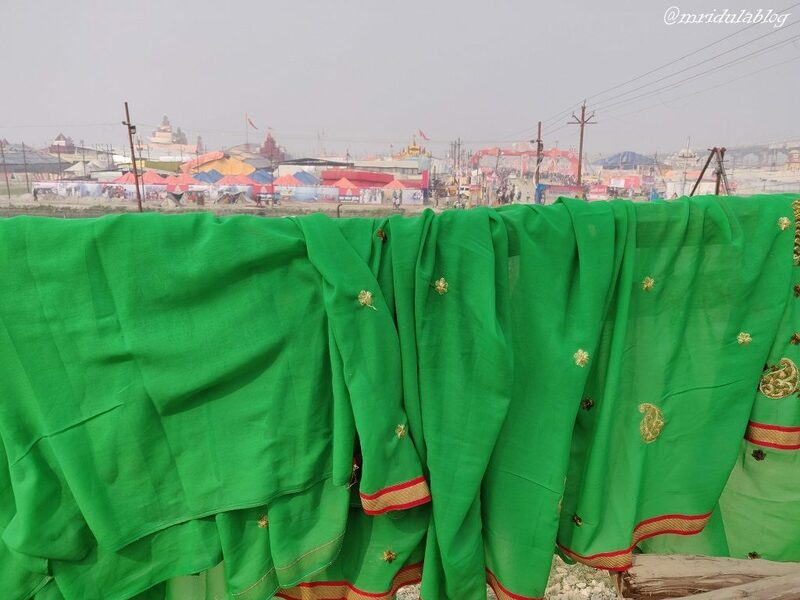 The mela grounds are clean and if you wish to click a picture, almost always you will get a toilet in the view! So if you are worried on the account of the cleanliness, don’t, the mela is really clean. It was crowded yet manageable. I had no trouble in walking, thanks to the crowd management done by the police and other authorities. We saw plenty of Naga Sadhus (but that is another story) and other saints. The area is huge so in our limited time, we saw only a fraction. But what I saw surely makes me want to go back for more. Taking a Dip in the River Ganga: I personally did not take a dip (only sprinkled the water over me and my precious story telling tools) but if you wish to do so, it can be done. Tent Cities like Indraprastham have their own private ghats. The public ghats on non shahi snan days are not too crowded. On Shahi Snan days you will have to wait your turn and brave the crowd. I am no expert on the water quality but I can assure you that sewage management is in place. Also the Ganga is a mighty flowing river and not a pond. But beyond this I have no idea about the water quality. Overall: This is my first visit to the Kumbh Mela, so I have nothing to compare it with, but I have come back impressed. The level of cleanliness is commendable. There is crowd but there is management too. I always thought that I could not go to Kumbh on my own, but I now think I can plan a trip myself! With all the discussion going around the home about Kumbh my daughter yesterday asked me- “so mom have you got rid of all your bad habits now?” I wish it was that easy, but Kumbh Mela has clearly made an everlasting impression on me! If I have missed out on anything you have a question about, please feel free to leave a comment. I will try to respond as soon as possible.